It’s hard to imagine a wardrobe without floral print. From darling tops to flirty dresses, blooming motifs are quintessentially feminine no matter the time of year (though, we know them to be particularly groundbreaking for spring, right?). In the summer months, florals abound but oftentimes can read sugary sweet instead of heavy hitting in the heat. That’s where unexpected formulas come into play—think bold-as-can-be print mixing, juxtaposed fabrics, and fresh tropical motifs— to kick the beloved pattern up a notch. Here, we’re breaking down four refreshing floral formulas to set a sizzling tone for summer. From a romantic dress you can wear to seasonal weddings to a too-cute top-and-shorts combo for date night, this is how you make florals feel groundbreaking in the sunny season. If you dare to print mix, stripes and flowers are genius in combination. For a breezy look in the heat, a frilled tank is perfectly punchy with multicolored wide-leg trousers (the key is picking a color from the various stripes for cohesion). White strappy heels are an optic finish. Give delicate florets an edgier spin by teaming with trim tie-waist shorts in faux leather. Finish with yellow heels and sleek aviators for a polished pop. A subtler method to print mixing, yellow snakeskin heels amplify the effect of a feminine mini dress. A stand-out look for date night or an end-of-summer wedding. 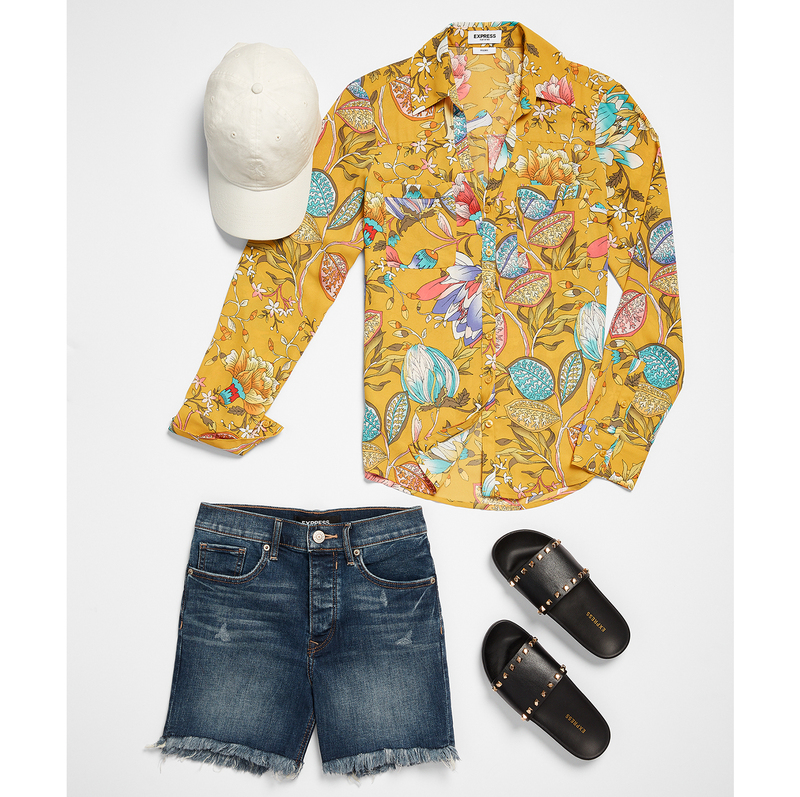 Go Baja-chic with a tropical-print button down and elongated cut-offs—a welcome reprieve from micro-florals and garden-party blooms. Finish with a baseball cap and slides for low-key occasions.